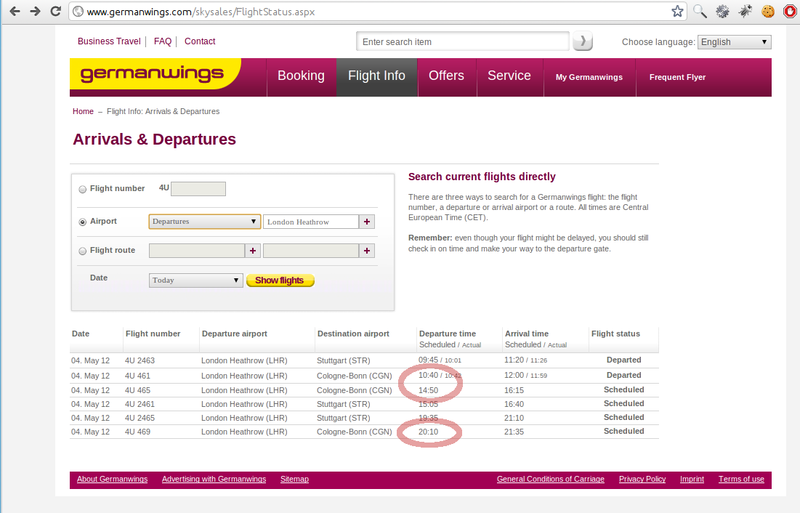 Langs, tech, stuff: Missed your Germanwings flight departure from London Heathrow or Stansted? 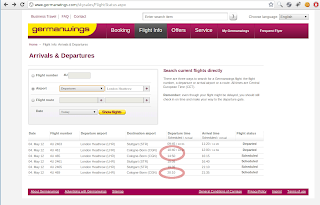 Missed your Germanwings flight departure from London Heathrow or Stansted? Do you trust your airline when checking your flight departure? If they have no idea of "local time" and concept of time zones, be careful or you can miss your flight! I just wonder how many passengers of Germanwings airline flying from UK are going to find that their flight has just gone... according to schedule.... errrr... what schedule? They publish departures times in "their" time zone, not the local one. It is weird, but... well... it is Germanwings. You've been warned. Ps - I spent some creative time working with time zones code. It is definitely not an easy thing even if it seems to be quite obvious. Ps 2 - Germanwings has no email, only premium phone numbers. No way to report them a bug, sorry Germanwings passengers. Ps 3 - It is not like intermittent - after 2 weeks, they are still proud to have this silly bug. Ps 4 - It looks like Germanwings... well... I hope they are never going to fly from New York or Dubai. This happened to me today. I checked my flight last night, on my mobile phone, and found that the flight had been changed to an hour later. Priding myself on having checked, I turned up to find that it was leaving in 25 minutes, at the 'original' time I had in my diary. I missed it, had a breakdown, and spoke to a very unhelpful man for a long time on the phone. Today has been a very expensive day, and I am livid. The Germanwings representative said that they catered for the 80% of passengers who were German, and wanted the flight times in their own time zone. But what about the other 20%??? I was looking at the website in English. I have NEVER seen the departure time written in another time zone than the local one. Surely they have a responsibility to keep to some international norms? ?